By connecting the technology to other systems, hospitals can reach higher levels of productivity. Computer-assisted coding (CAC) has long been touted as a transformative technology capable of accelerating workflows, increasing accuracy and completeness, overcoming the chronic coder shortage, and freeing resources to focus on more complex coding and data analytics. Yet it wasn’t until recently—as ICD-10 inches toward reality and HIT adoption exponentially increases the volume of clinical documentation flowing through coding departments—that CAC has taken hold in the inpatient setting. As hospitals begin evaluating the role CAC fills within the larger enterprise HIT strategy, they are discovering that maximizing the technology’s benefits requires integration with systems far beyond the encoding programs that are commonplace in most facilities. These typically include clinical documentation improvement (CDI) and voice, text, and speech recognition systems. If a hospital’s abstracting system features a workflow engine, it too should integrate with CAC. 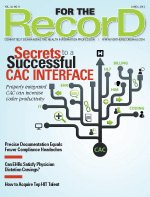 Further, while it may not be a direct link, CAC ultimately ties back to the EHR system, according to Deborah Kohn, MPH, RHIA, CPHIMS, FACHE, FHIMSS, principal of Dak Systems Consulting, which specializes in IT assessment, planning, and strategy services for hospitals and other healthcare organizations. According to Kohn, the complexity of CAC lies in the natural language processing (NLP) engine that is at the heart of the software. Unless a hospital is using speech recognition technology across the enterprise, NLP will be unfamiliar to many who will be required to use it with CAC. Michael S. Bee, director of emerging markets for 3M Health Information Systems, also points to the number of systems with which CAC may interface as upping the complexity level. Most clinical information systems on the market today have the ability to integrate with CAC and pull in text for processing through Health Level Seven International (HL7) interfaces. Identifying existing interfaces is one way to ensure successful CAC integration, which can be accomplished as part of a comprehensive needs and workflow assessment. According to Kohn, this assessment should take place well before the software is selected. It should analyze not only organizational needs for CAC but also how the hospital plans to use the underlying NLP engine, particularly if it will be used for multiple purposes such as speech recognition. Other systems already in place, including financial, are also subject to analysis to determine which should be integrated and whether they are compatible with CAC. This was the process adopted by Harris County Hospital District, where a comprehensive internal assessment determined that properly integrated CAC could increase coder productivity as much as 100% on the outpatient side and 20% on the inpatient side. The Houston-based hospital system, which includes one specialty and two full-service hospitals, is taking things a step further by undertaking an exhaustive request-for-proposal (RFP) process. In fact, the composition of the RFP steering committee provides a glimpse into just how deeply CAC will be integrated into Harris County’s systems. It includes representation from billing, registration, quality assurance, CDI, HIM, IT, and coding. In developing the RFP, the committee sought to address everything from how the implementation would be rolled out to system scalability, maintainability, price, productivity, and accuracy. As such, Harris County’s evaluation included coder input on everything from the screens they would be viewing to ease of use. The final product would also need to accommodate HL7 feeds and could include options such as software as a service and cloud- or Web-based models. Keeping IT involved in the RFP development process is also crucial to ensure the health system winds up with “what will be the best fit for us in our Epic environment and that will allow for the most seamless data exchange possible,” says Kaitschuck, who notes that part of the goal with CAC was to prepare for ICD-10 and allow the health system to function in a dual environment until the transition was complete. Like Harris County, Hays Medical Center in Kansas conducted a comprehensive needs assessment to determine which systems it would interface with CAC, which it implemented in 2009. This led to the decision to include all systems through which physician documentation flowed, including dictation and its MEDITECH abstracting system. “We just went through the whole list of what [documentation] in the EMR coders code from and interfaced as much of that as possible with CAC so the coders don’t have to flip-flop from MEDITECH to the CAC system,” says HIM Director Deloris Farthing, RHIA. Hays Medical Center eventually deployed 3M’s CAC software and realized an immediate coder productivity gain of 25%. This enabled the hospital to take over coding from two partner critical-access hospitals without having to expand its coding staff. It also revealed the need to provide its CDI case managers with access to CAC functionality. Because the case managers are not trained coders, the ability to have codes already identified in the documentation they are auditing would make the process of identifying working diagnosis-related groups (DRGs) more effective and accurate. That is why Hays Medical Center jumped at the chance to act as a beta site for 3M’s 360 Encompass System, which combines CAC and computer-assisted documentation improvement into a single software. It not only provides the CDI team with access to all the necessary reports and functionality, but an integrated CAC-CDI system also ensures coders and case managers are connected, eliminating duplicative efforts and accelerating workflows. According to Bee, interfacing CAC with documentation improvement tools addresses two of the most significant challenges confronting today’s coders and CDI specialists—challenges that are exacerbated by the transition to ICD-10. The first is specificity and completeness of clinical documentation. The second is the pressure to maintain productivity. For example, a physician may initially indicate congestive heart failure, and testing may later reveal the specific type. The CAC system’s NLP engine can be “trained” to find verbiage indicating a more specific diagnosis may be presented but not yet documented by the physician. It then triggers a confirmation query. “It’s a subtle change, but instead of thinking from documentation to codes, you’re going from codes back to evidence,” Bee says. For hospitals that have not yet taken the CAC plunge or have not yet interfaced CAC with documentation improvement and other systems, procrastination may not be an option for much longer. As Bee notes, the volume of documentation is growing exponentially thanks to the broader adoption of EHRs. A single inpatient encounter can generate anywhere from 200 to 3,000 pages of documentation.